I was really concerned about my milkman. Warren delivers a gallon of skim, a quart of 2% and a quart of chocolate milk to our house every Thursday morning. Sometimes he leaves a sample of yogurt or a new kind of milk the creamery is promoting (orange cream was unbelievable…a liquid dreamcicle). I work from home and my desk is in view of the front door which is always open to the storm door. If I’m on a phone call or deep into my thoughts (or typing) he gently taps on the door to make sure I know that he’s put the bottles in the milk box (especially important in the summer months!). Warren chats (but just a little), sometimes showing me a new truck or to let me know if the delivery schedule is changing because of an upcoming holiday. If I remark that we meant to decrease the order because the boys have gone back to college (or we are going to be out of town) he just takes a bottle or two back to the truck. Want to change next week’s order? Just tell Warren and he’ll take care of it. 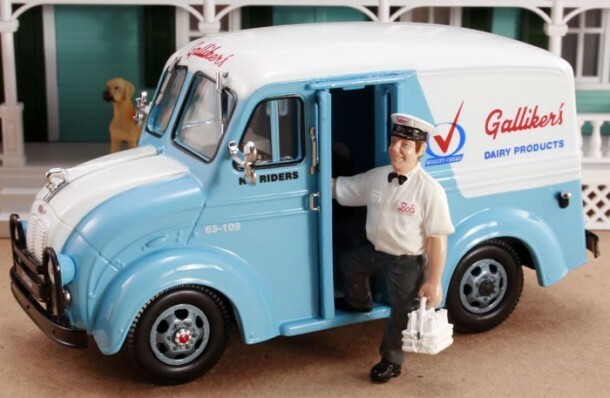 I even took a picture once of Warren next to his truck to post to Facebook to prove to people that I really did have an actual milkman come to our house every Thursday morning. Sometimes Warren brings along a younger delivery person who he is training. I always tell the trainee…listen to and watch Warren…he’s the best! They always smile and nod as though they’ve heard this at more than one stop. Your normal driver, Warren, has suffered some very serious health problems. At this time we don't know if he will be able to return or not. In the interim we have a substitute driver running his routes. You can expect much later deliveries while he learns the route and your locations. We're aware that many of you are very fond of Warren and I'm sure wish him the best. In light of that I'm including his address for those who might wish to send him a get well card or good wishes. We apologize for any inconvenience this may cause and as always appreciate your continued business. It made my heart jump and my stomach sink! Warren wasn’t young and he had told me that several times he had tried to retire (always coming back to “help”), but Warren was my friend. I was in a relationship with Warren and I was genuinely concerned for him. So I sent him a card and I prayed for his improved health. And then I brought the kids at LOGOS in my church into the loop. They have a ten minute informal gathering time before we all go to dinner on Wednesday nights and so I asked them to create cards for Warren. Of course I first had to explain what a milkman was and why I cared so much. One of the boys asked if I was in love with him! And I said yes…in a way. Some of the card makers were clever and included a drawing of a cow or a milk bottle and others just said, “Get well soon!” They were concerned that Warren wouldn’t know who they were, so I assured them I would include a note of explanation. He’s my milk delivery person and I see him (maybe) once a week for (possibly) two minutes at a time and we have a relationship where we care for one another. Can we say the same about the children and youth in our churches? How deep are our relationships there? Do we just pass one another in the hallway? Do we even know each other’s names? Does our heart jump and our stomach sink when we hear about health (or emotional or mental or spiritual) problems? Do we send handmade cards and pray? At The LOGOS Ministry we believe that a saving relationship with God through Jesus Christ is the most important thing in life and that nurturing that relationship is the most important thing the church ever does. We also believe that most young people (most people of any age actually) get to know Christ through a relationship with another person. Who was that person for you? Are you that person for the young ones in your church…and community? I had barely finished showering and getting dressed for work yesterday when my husband shouted up the steps that I had missed Warren by a few minutes. HE WAS BACK!! And he told my husband that he just wanted to give me a hug. So he’d see me next Thursday. May your relationship with all God’s children be just as meaningful.